Nathaniel and I headed back to California yesterday where we left the teens-degree weather in Indianapolis just in time. It is always difficult saying goodbye to my family but I take comfort that we at least have an idea when we'll be back next. 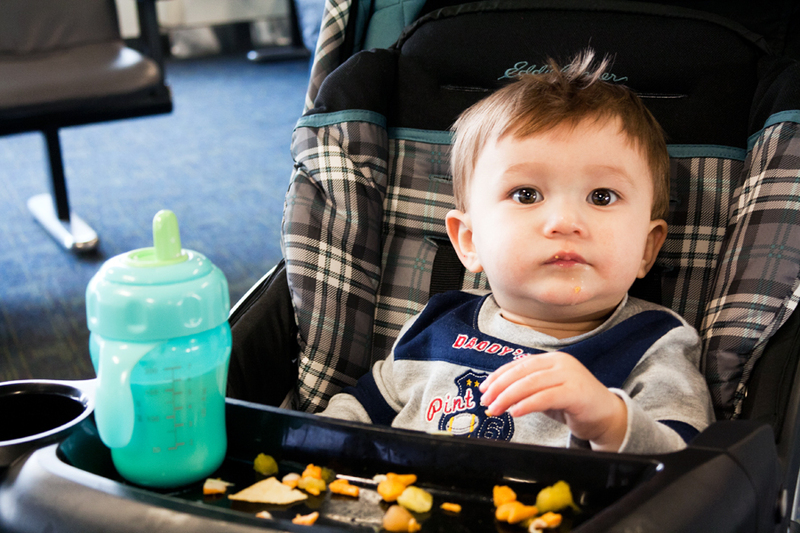 Eating fruit, cheese, goldfish crackers, and baked chips while waiting for our last flight of the day; This would be Nathaniel's 20th plane ride. wow the little one is a frequent flyer! Have a safe trip home and back to the warmer weather. Found your blog through Comment Love Sunday. What a beautiful family! Your son is so adorable. Hope you have a great flight! Happy Sunday! Oooh, btw, that recipe on the side looks awesome. I'm visiting from comment love day! What a cutie patootie you have!! I, too, am married to a military man (he leaves for Afghanistan in May w/the active Army), and I stay at home w/our 4 boys. 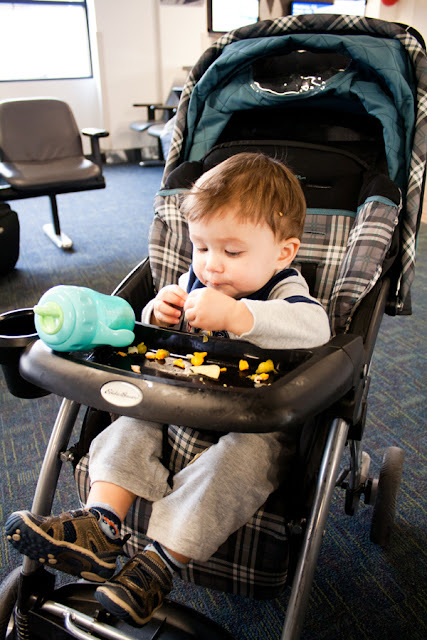 Is your little guy a pretty good traveler?? We don't fly or travel period. We did go to Disney world last Christmas...but w/4 kiddos, what a lot of work! sorry- one more thing...the verse at the top of your blog is one of my favorites. It's written on my menu board in my kitchen. I love it. Someday I want it calligraphied (i know it's not a word!) around my door frame! That is a lot of flights! Guess he's got it down by now. wowza your little man is quite the travel :) and very handsome I might add!! Found your pretty corner over at FTLOB!!! Can't wait to read more about you. Wow! 20th plane ride?!! Amazing! Ok! That's a lot of flights! I like you blog. I found yours through FTLOB. Look forward to coming back.